Know of immediate charitable needs. Do immediate good. Get immediately rewarded. LocalGood is a free location based charity app that makes it easy for you to do good in your zipcode. We're partnering with charities to accelerate good! LocalGood is piloting in the cities of Santa Clara and San Jose in California. 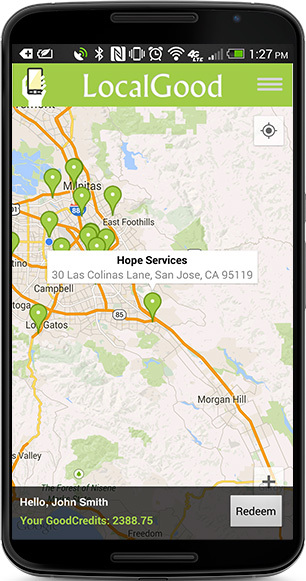 We are launching with Hope Services in San Jose, expanding across the Bay Area in the next 6 months and going inter-city next year. Start using LocalGood, rack up GoodCredit and "Give it away. Now"! GoodCredit™ is a proprietary LocalGood points system that is awarded upon fulfilling a good deed. GoodCredit™ is redeemable at local merchants against deals and offers & works similar to Airline miles or other loyalty points related systems. GoodCredit™ is not a form of currency and cannot be exchanged or redeemed as if it were a form of currency. Doing LocalGood is as easy as downloading the app and starting to do immediate good. Sign up and use LocalGood for free to improve local awareness of charitable needs. Sign up for free and drive significant traffic to your storefront with LocalGood.